From the very moment we started planning to start up the company, we had a clear objective of creating workplaces focused on people who were especially unprotected. It was then that we discovered a sector of the population whose need was imminent and urgent. Of the CERESO de Querétaro, with whom we are manufacturing an important volume of our total production of plush dolls, especially with regard to special promotional plush projects. 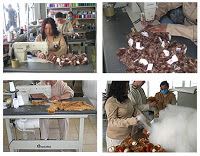 It is noteworthy that the inmates who collaborate in the manufacture of our stuffed animals, have demonstrated throughout this time a great responsibility and dedication in their work, obtaining peluches of great quality and with a reduction in materials almost null, Production volumes are extremely high. The TV NOTAS magazine published in its last December issue an interesting article regarding the life and work of the inmates, especially in the manufacture of stuffed dolls, as well as gowns and slippers for Spa’s and hotels.